Your home’s flooring plays a significant role in determining the look and feel of your home. Sometimes, due to wear or significant damage, your flooring will need replaced, or you may just want to update the look of certain areas of your home. If you need new or updated home flooring, whether it’s hardwood, vinyl, or tile, you can rely on Sears Handyman technicians to handle the installation of your chosen materials. Once you have chosen your materials, a Sears Handyman will take care of the hard work of installing your new hard flooring. Hardwood flooring adds both elegance and grace to your kitchen, hallways, and family gathering areas. The problem? Hardwood flooring can be difficult to install for the average homeowner and usually requires the experience of someone who has worked extensively in home repair and home improvement. Installing hardwood flooring usually involves a variety of steps to complete effectively, including removing current flooring and base molding, cleaning the subflooring, installing vapor barriers, and correctly installing the floorboards and new base molding to ensure that the flooring is securely in place. With a hectic schedule, some homeowners feel this is too much to accomplish on their own, especially with other obligations, and others feel like they wouldn’t know how to install hardwood flooring correctly. 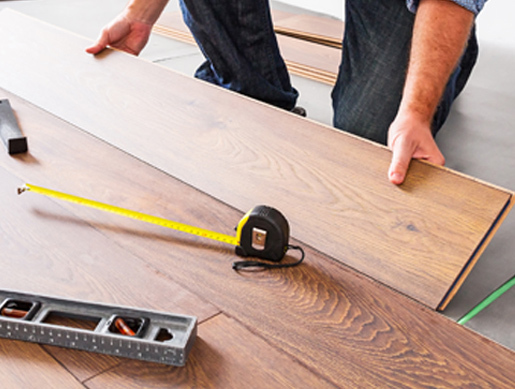 When you’re too busy or aren’t sure how to make your hardwood flooring vision a reality, contact the technicians at Sears Handyman for assistance. Our staff has years of experience in home improvement projects and can tackle tough flooring installation projects that will make your home look great. Laminate flooring resembles wood, tile, or stone and can be purchased in a variety of shades and colors. Aesthetic appeal attracts many homeowners to laminate flooring. Made of several layers of composite material, laminate flooring’s top, visible layer includes a designer photograph of the material it’s supposed to resemble, making it an excellent imitation. Laminate flooring appeals to homeowners not only for its attractiveness, but also its durability—laminate flooring resists fire, slipping, and water damage. It is also easier to clean and care for than actual hardwood. Homeowners see savings with the material as well: laminate flooring is typically two-thirds cheaper than the material it resembles. For durable, resilient flooring that makes any room look great, laminate flooring is a great option. 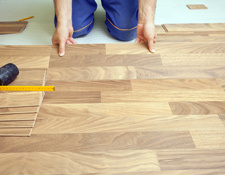 Flooring installation can be laborious and difficult for many homeowners. When you need professionals to install your next flooring project, you can rely on a Sears handyman. Our personnel have experience with a variety of flooring projects and will be happy to discuss any questions you have about flooring installation. Vinyl flooring derives from polyvinyl chloride, a chemical that forms the basis of many plastics. Vinyl has a variety of applications and has been used in flooring since the 1930s. Relatively cheap and easily cleaned, vinyl flooring is often found in hospitals and laboratories. These days, vinyl flooring has also become popular in residential homes and apartments. Cheap and easily maintained, vinyl flooring can also be ordered in a variety of colors, designs, and styles. 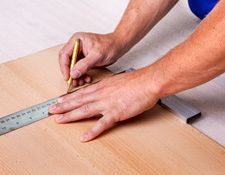 For expert vinyl flooring installation, call a Sears handyman. Our technicians can discuss vinyl flooring installation options with you and provide a cost estimate based on the installation project you have in mind. Tile flooring and backsplashes can vastly improve the look of your kitchen or bathroom. Available in multiple designs and patterns, tile flooring and backsplashes not only look great but act as an effective flooring material for rooms where water spillage is possible or likely. Due to the grout sealant between tiles and the non-absorbent nature of tile itself, tile floors usually don’t suffer the same water damage as hardwood or carpet. If you need tile replacement or installation, Sears Handyman can help. Our staff knows how to perform the many steps of tile installation with precision and craftsmanship. 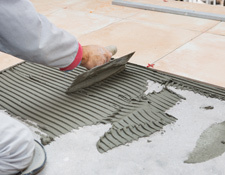 Some homeowners don’t feel comfortable performing the intricacies of tile installation themselves, which include preparing your current flooring by leveling out high and low areas and smoothing imperfections, installing the appropriate sub-floor or backer board, laying the tile, grouting, finishing the grout, and then applying the grout sealant to prevent water from reaching the floor. 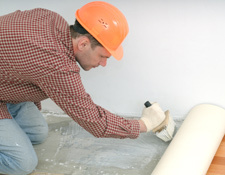 When you need new tile installed or old tile replaced, you’ll probably need a handyman. Give your local Sears Handyman Services location a call. A representative will be happy to talk you through our service process and arrange a service call convenient to your schedule. Once your appointment has been arranged, you’ll have a new tile floor or backsplash in no time.